It started as so many collaborations do, through a beer. 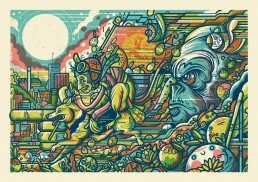 Drew Millward was dropping off a portrait of John and Jane Marshall. John Marshall was responsible for the building Temple Mill, Leeds, and by extension of that, building the flax store, home to Northern Monk. A bond was formed. 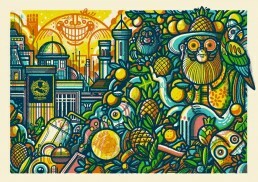 Here we speak to Drew about his remarkable artwork for the new Northern Monk Northern Tropics series and his other work for clients including Bundobust, BrewDog and 21st Amendment. What was the brief you were given from Northern Monk? There really wasn’t one. In fact, it was almost the other way around. We drank beer, we discussed what we like about beer, I told them that my ‘holy grail’, in beer terms, is basically to find something that tastes like a hoppy Um Bongo. They went away and concocted ideas for what sort of beers might fit that bill, and I just got to work drawing pictures that combined Leeds’ industrial landscape and a load of tropical nonsense. It was pretty much a dream project really. Like having a suit tailor-made. The Northern Tropics series have genuinely been some of my favourite beers I’ve had in years and to play a part in how those are presented to the world has been an absolute pleasure. Long may it continue. How did you first get into illustrating in the first place? Somewhere, in the mists of time, I started making posters for gigs that myself and some friends were booking. We needed to advertise the shows, so myself, and my buddy Luke Drozd took turns in designing flyers and poster for the stuff we were putting on. That friendly rivalry between us probably spurred us on to do better things as time progressed. From that, people saw the work and started asking me to make posters and such like for them. I think someone offered me about £35 to make a poster for a show in London, shortly after which I quit my job. That was about 14 years ago. Since that point, I’ve more or less, kept the lights on by drawing pictures. I suppose I fell into it, as it was never a goal or ambition to do this, but I wouldn’t change it for the world. You have such a distinct style, where does your inspiration come from? Anywhere and everywhere. I suppose my roots in posters and screen printing plays a massive part in the way I work, and the work I make, and certainly the worlds of music, DIY and punk rock all play a part in what/why/how I operate. I would say, stylistically it’s probably a progression over the past 14 years of looking at design, illustration, art and ephemera, filtered through my own mind and limited capabilities. You’ve done quite a bit for Bundobust, how did that come around? Those folks are good people. Leeds is a small enough place that most people know of, if not know each other, certainly in more independently minded circles, so things often come about fairly organically. Marko Husak asked me to get involved with what they were doing, and since I drank (at The Sparrow) and ate (their street food before they got the bricks and mortar place) there, it was foolish not to. I love what they do and how they do it, so it’s not difficult to get behind working collaboratively with these people. I think a lot of people within the independent community, and you see it a lot in the smaller end brewing industry as well, have a great attitude and mind set about taking risks and working with artists or other like-minded people. It goes back to the principals that punk rock and the DIY music communities are built on. It’s a good way of going about things. It doesn’t work on everyone, but beer has the power to perform a kind of transformative magic. One minute you have an average interest in the impact of flavour on your palate, enjoying the odd glass of wine or pint of lager. The next, you’re on your way to jacking in your job to make, sell or communicate about beer and converting the cupboard under the stairs into a cellar space. It happened to me in 2004 in Portland, Oregon, and I’ve seen it happen to a great many people since. Sometimes I’m lucky enough to witness the actual moment: a handful of times, I’ve been the perpetrator of it. I’ve seen it happen to men and women, close friends and strangers. And now, I think I’ve just seen it happen to an entire region. 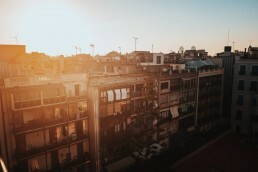 Barcelona has always been one of my favourite cities to get drunk in. For a long time, the only beer available was Estrella, but that wasn’t the point: it was the manner of its drinking that was so appealing. In the Boqueria — the best food market in the world — Estrella was served ice-cold from the bar of a little kiosk where fresh langoustines wriggled on a hot plate a few feet away. In side-street bodegas, Estrella was served in tiny glasses — or cañas — to accompany plates of padron peppers, octopus or heroic portions of patatas bravas. And in the twisting warren of the old Bario Gotic quarter, Estrella was drunk in pints in a selection of randomly themed bars. Four years ago, I was back in Barcelona and looked again for these bars. They’d all gone, replaced by generic craft beer bars from central casting. All sold beers from Meantime, Brooklyn and BrewDog, and all had stripped wooden floors, bare brick and a smattering of heavy metal sights and sounds. I could have been in London, Manchester, or Nottingham. Sitting on a bar stool sipping a pint of Punk IPA, the ghost of the Starsky & Hutch theme bar that had once stood here whispered in my ear, ‘This is what you wanted, isn’t it? I distinctly remember you complaining that it was just Estrella last time you were here’. If this was victory, it felt hollow. 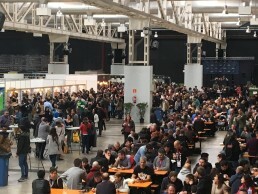 In March 2018, I’m back for the seventh annual Barcelona Beer Festival, in a vast convention centre reminiscent of the Great American and Great British Beer Festivals. There are brewers and drinkers here from both those countries. I suspect they’ve not come all this way to try beers from Brooklyn and BrewDog. The day after the festival, we’re driving up into the hills through stunted, winter-pruned vines. At one chilly peak in the centre of a region most famous for Cava, Tempranillo and Grenache, we meet Carlos and Montse Rodriguez. They quit the city for an almost ruined former winery around the turn of the millennium. In a cool stone room that smells of cats and has a bar that looks like it was stolen from a Devon country pub, Carlos serves us some of the best traditional British cask pale ale I’ve tasted in many months. In the cellars next door, this self-taught brewer is re-fermenting his beers in local red wine barrels with a wild Brettanomyces yeast he isolated and cultivated from the air around us. Catalonia has lots of wine barrels. That’s why at least a third of the breweries here have a barrel ageing programme. But it doesn’t have much in the way of hops and barley. That’s why Oscar Mogilnicki Tomas and Quiònia Pujol Sabaté have put together the ‘Full Circle Project’, with the aim of growing everything they need to produce a beer not just in, but entirely of the region. 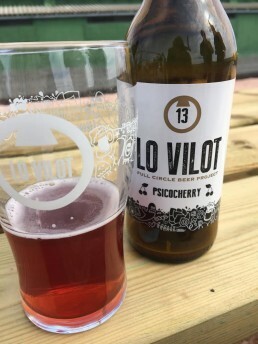 He’s an engineer, she’s a biologist, and together they’ve built the Lo Vilot brewery by hand. 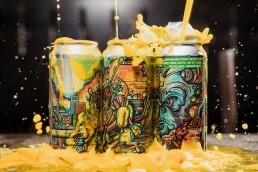 The number of different skills they possess between them defies comprehension, as does the consistency of their range of beers including sour fruit beers, IPAs, Pilsner, wheat and Belgian-style ales. Back down in Barcelona, over a bourbon barrel-aged Belgian-style dubbel, someone asks the American-born head brewer of Edge Brewing what attracted him to the idea of working in the one of the world’s most beautiful cities. ‘You’re from a scene from the US — which had lost its beer culture — brewing in a country that never had a beer culture to start with. So, you’re doubly removed in terms of creative freedom,’ he replied. 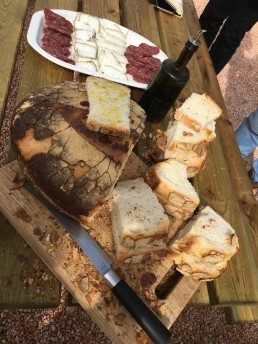 Days later, after gorging ourselves on homemade salami, barbecued spring onions dipped in romesco sauce and the simple brilliance of rustic bread rubbed with garlic and ripe, fresh tomatoes before being drizzled with olive oil and salt, all offered at every one of the dozen or so breweries we visit, I decide this creative freedom is one half of an explosive combination. Catalonia may have never had a beer culture, but it’s always possessed a proud sense of gastronomic independence, a genuine love of food that is as amazing as it is simple and democratic. Craft beer was a perfect foil, a natural fit. After that initial wide-eyed genuflection to the global titans of craft, the Catalonians simply got on with the job of making beer their own. They’ve only just started, and already they don’t seem to be able to brew a bad or mediocre beer. On my next visit, I suspect it may be my turn to have my original beer epiphany all over again.